We should all cherish the moments we have with our families. Life is short, and it can get so hectic that we can neglect spending time with the ones we love in favour of work or sleep. Not to mention that some of the greatest Nintendo games are only single player! Thank goodness for the party game craze, right? Problem solved. Oops! 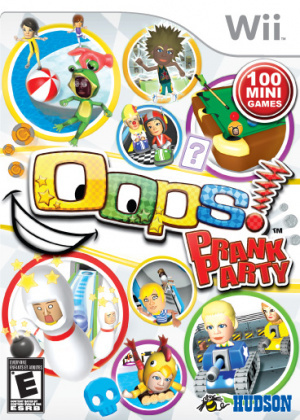 Prank Party is the typical vehicle of family fun that we've seen on the Wii several times. It's a mini-game collection, of course, and is controlled solely with the Wii Remote, which you'll be holding and waggling in every conceivable way throughout the 100 offered events. Calling the available activities "mini games" is actually rather generous, as the vast majority of them are labelled as one-shot challenges that should really be called "micro games" a la the Wario Ware series. None are completely original, but each is executed in a decent manner. The developers are well aware that the market is saturated with games such as this, even going so far as to indirectly address the issue in the game manual: "So, what sets Oops! Prank Party apart from other mini game collections?" See? They know. But they also know that the controls better work well and that most of us are aware of how to use them by now. Rather than forcing you to view tutorials the first or every time you play a mini game, you can see an optional diagram by pressing B. For the most part, it feels intuitive and responsive, but there are a few games that suffer from clumsy controls, such as Tank Battle. Here you're supposed to drive a tank by holding the Wii Remote sideways and steering Mario Kart style. The rotation of the remote feels completely disconnected from how the tank moves. In fact, a lot of the games that require you to hold the remote sideways and tilt to steer or maintain balance are a bit off. The obligatory balance on top of a ball game is a great example of this. You have to tilt pretty dramatically to fall off the ball, when a more delicate approach usually makes that type of activity more engaging and fun. To answer the question posed in the guide, Oops! 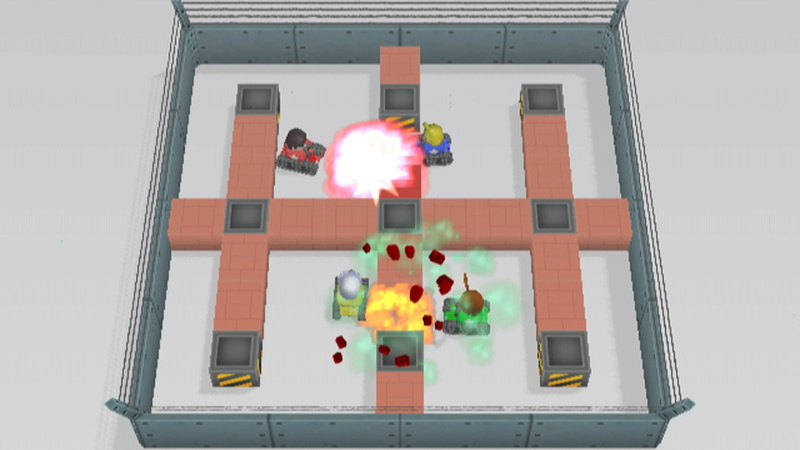 Prank Party is set apart from other similar titles by the pranking system. 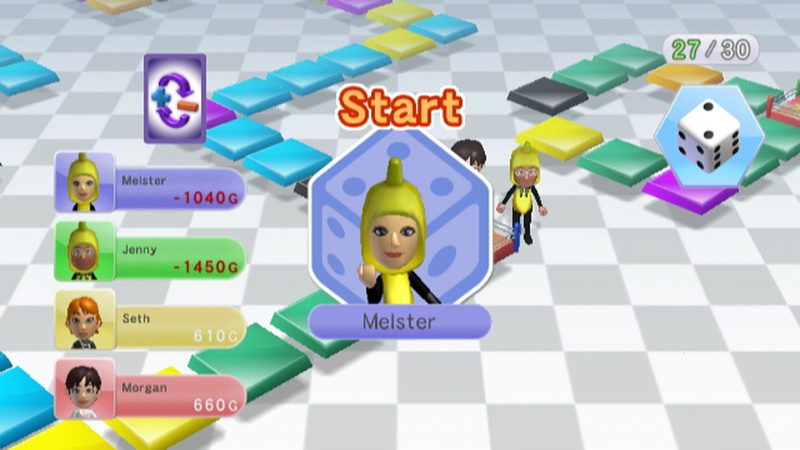 After mini games, the winner will usually be given an opportunity to play a joke on one of the losers, such as making their avatar wear a silly costume. There is an in-depth avatar creation menu that will certainly remind you of the Mii Channel, and the level of customisation is pretty high, letting you set everything from how big your characters ears are to what clothes they wear. You're given the option to build an avatar from scratch or start from a pre-set build based on keywords like "cute" or "goofy". Making your perfect Oops! Prank Party avatar could take over an hour, which makes it a huge bummer that you can't import a Mii as a starting point. 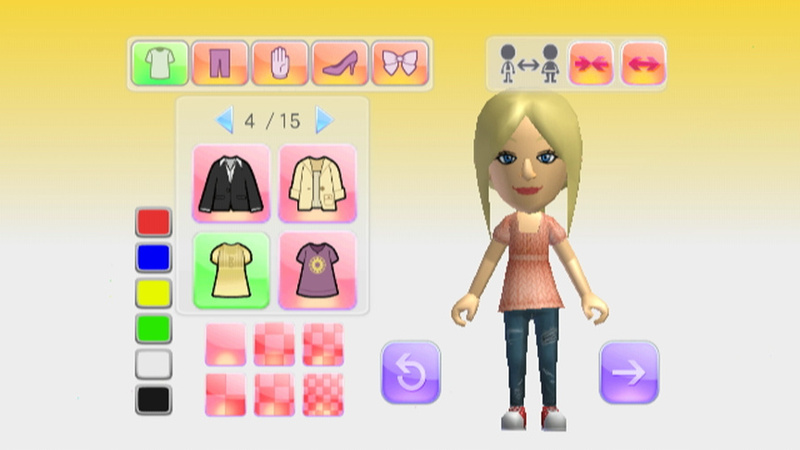 When most people buy a Wii they spend some time creating the Mii they'll use. Going through the entire process again to create a character that looks just like you may appeal to some people, but casual players that just want to join in on the family fun will probably skip out on it and use a random avatar. This removes some of the joy of pranking Grandma and making her wear a Santa Claus suit – it's not funny if the character doesn’t look like Grandma, and Grandma may not have the time or patience to create a suitable avatar. Overall, in fact, this is a classic example of a game that thinks it's hilarious but isn’t; most of the awkward pranks, the hokey jokes, and the cheesy character animations are just not funny. Still, being able to affect the other players could lead to some laughs among the family or friends you're playing with, even if it's just because the game is so not funny that it’s funny all over again. There are four modes, and each can be played with one to four people. Master Mode challenges you to complete each mini game at the highest difficulty setting, while Practise Mode allows you to test your skills against the Master Mode without keeping score. There's a Free Play option in which you can select any of the one hundred games to play one at a time, where you can also earn trophies and unlock new costumes for your avatars by racking up a certain amount of wins. Board Game Mode has become a staple of this genre as well, and Oops! Prank Party gives it a shot. It's executed rather badly, however, with too many negative consequences and not enough rewards. It also takes forever to play because of frequent loading screens and lengthy explanations of what's going on every round. The player is given the option of how many rounds to play before declaring a winner, and even on the lowest setting of 30 it can still take a long, boring time. In several rounds there isn’t even a mini game challenge in which to compete. This mode might not have been so bad if the pace had been quicker and mini games were more frequent. As far as graphics go, Oops! Prank Party is in the middle of the road. Everything is sort of rounded and gives off a shiny glare. The avatars greatly resemble Mii characters and move in a jerky, cartoony fashion. They aren’t beautiful or terrible and could be comfortably called average. When it comes to the music, though, the game is just plain annoying. Loud, tinny, looping tracks follow you wherever you go. It’s like being trapped at the rehearsal of a travelling circus band, but not in a good way. When all is said and done, Oops! Prank Party is just ok. While the wide selection of mini games is nice, most of them are too short for the player to sink their teeth into. Playing jokes on your family when you win may be fun, especially if they take the time to create an avatar that resembles them closely. The humour in the game is a bit embarrassing, but the real laughs will come from the people you’re playing with while you enjoy spending time together anyway. This will definitely be overshadowed by superior games in the same genre, but it's at least worth a look at its bargain price. Awww, I thought this one would be alright. Looked funny in the vids. Next person to release a party game gets an axe in the face, courtesy of me. I just can't get enough of those awesome fake Miis. @Raylax That would be Namco. It's Pac-Man's 30th Birthday and he's getting a party. This review is way too positive. This game is far from okay. It is garbarge through and through. My 6 year old and 3 year old hated this just as much as me. @Gamesake: Namco, huh? I'm going to need a few more axes. Good god, if there's anything more whored out and done to death than party games on Wii, it's Pacman. The game is fun but totally average in every way. It's also funny, but not as funny as it thinks it is. Still, it's fun to play with some casual gamer friends. "Still, it's fun to play with some casual gamer friends." @Darel - that's a shame, because there's some very good party games out there. I hear Disney Guilty Party, which we reviewed earlier this week, is a great example. Maybe board games aren't your thing, but that's different. Gameday is right, WHERE IS MY KIRBY!? Sorry, i just really like kirby! Anyway, I might have to loan raylax my ax. OMG this game got a 5, what a shock!!! Not be mean but there are (even now) a ton of great wii exclusives and great wii ports that I've been very curious about and really wanted reviewed by this site like the wii version of the force unleashed 2 which is completely different from the PS3 and 360 version, but you guys are actually STILL reviewing shoval ware!! Which is very annoying to me that you would review a game not one person who has a wii is even thinking about when there are so many highly underatted great wii titles out there that could actually use a good review so more people can you and buy them. @NINTENBOY - have you tried shooting us an email and asking us to feature some games you're curious about? We might just do it. We offer 100% review coverage of Nintendo's download services and usually hit most of the Wii exclusives, but when we miss one you're interested in, let us know. Or hit the forums! This is why people hate the Wii. Too many crappy casual party games! One is enough! dang, looks like it could have potentail, but wii party seems btter. "Players cannot use Miis here unfortunately, because we couldn’t do what we wanted to the characters according to Nintendo’s Mii regulations." I'll get Wii Party instead. Nintendo Power and Nintendo Life said it great. Buy the way: Do you lke my new avatar? WOW. How stupid can these games get?